Two union presidents were among the 111 workers and activists arrested at a pair of Labor Day protests in California. UNITE HERE Local 2 president Anand Singh and Wei-Ling Huber, president of Oakland-based UNITE HERE Local 2850, were some of 75 people taken into custody by police for obstructing trolley tracks near a JW Marriott hotel. The union has been locked in a dispute with the hotel chain, only to see its national contract with the hotel giant expire on Monday. The contract covered 12,000 of its 20,000 members working at Marriott. The labor group had anticipated arrests prior to the protest. Singh, who was taken into custody wearing a "One Job Should Be Enough" t-shirt, said in a statement that civil disobedience was necessary to bring attention to job security, wage, and working condition issues at the hotel chain. "Hotel workers are the backbone of San Francisco's wildly profitable tourism economy, but we ourselves struggle to survive here," he said. "We proved that we are prepared to do whatever it takes to transform the hospitality industry and make one job enough for workers to make ends meet." A spokeswoman for UNITE HERE's national organization hailed the group for standing its ground and also praised police for their professionalism in dealing with the nonviolent protest. The San Francisco protest was one of eight demonstrations the union participated in outside of Marriott hotels across the country. "We are happy that the demonstrators who were jailed have all been released safely and were treated with total professionalism from the arresting officers," she said in an email. "San Francisco's UNITE HERE action was one of eight led by Marriott workers whose contracts have expired across the country yesterday, all targeting the employer in shows of power after being unable to reach agreement on key issues in what has been many months of contract negotiations in these cities." The spokeswoman confirmed that local unions will cover the costs of citations and legal representation for those arrested. She emphasized that all of the arrests were linked to peaceful activities. "UNITE HERE locals did ensure all arrested demonstrators received aid and can confirm that all workers who engaged in the peaceful acts of civil disobedience have now been released," she told the Washington Free Beacon in an email. "The only arrests made throughout the day were regarding peaceful acts of civil disobedience." A spokesman at the San Francisco Marriott did not return requests for comment about the protests and arrests. The San Francisco protests were not the only Labor Day demonstrations that resulted in arrests. Three dozen workers and activists from Service Employees International Union-United Healthcare Workers West (SEIU-UHW) were arrested in two separate protests outside Kaiser Permanente facilities in Downey and Oakland, Calif. SEIU-UHW has picketed outside of the health care provider numerous times in 2018, angered by management's decision to negotiate with a handful of smaller bargaining units before addressing the union's contract, as well as plans to outsource call centers to vendors hours outside existing facilities. "We have bargained as a coalition and that's how it's traditionally been done," SEIU-UHW spokesman Tom Parker told the Washington Free Beacon. "Part of Kaiser Permanente's reputation is its strong relationship with workers, but in recent years the focus seems to have shifted to the bottom line." A Kaiser Permanente spokesman said the health care provider has been adding jobs, rather than cutting them, pointing to the addition of more than 8,000 union positions in recent years. The company said it is offering "up to one year's salary" for workers affected by moving call centers and pledged to help them find other work. "Whenever business conditions do require us to make changes to staffing, we communicate transparently and thoughtfully and well in advance with union leadership," the spokesman said in a statement. "Where such decisions are unavoidable, we provide tools and assistance, including up to one year of salary and benefits equal to the affected employees' then-current compensation, to support affected employees and help them gain other employment opportunities." Parker, the SEIU-UHW spokesman, said the Labor Day protests had been brewing for months. The union decided to include obstructing traffic in addition to its picketing to send a message. It will cover all costs associated with the arrests and citations for the 13 workers and activists in Downey and 23 in Oakland who were detained during the protests. "It's something we felt was needed to step things up and get serious," Parker said. "Kaiser Permanente is proposing all of these changes that will hurt not only workers, but care as well—it will not be as good for patients or for the communities our members live in and serve." The health care provider said it is still dedicated to negotiating with its bargaining units and was critical of SEIU-UHW for taking "an adversarial, destructive approach" to negotiating. The spokesman said it has not faced such hostility from other labor groups in its workforce. "We are disappointed that the current leadership of SEIU-UHW has chosen to mischaracterize Kaiser Permanente's strong commitment to labor and to pursue an adversarial, destructive approach to its relationships with several California health care systems," the spokesman said in an email. "SEIU-UHW's approach stands in stark contrast to the productive, progressive relationships we have maintained with many other unions representing our employees." 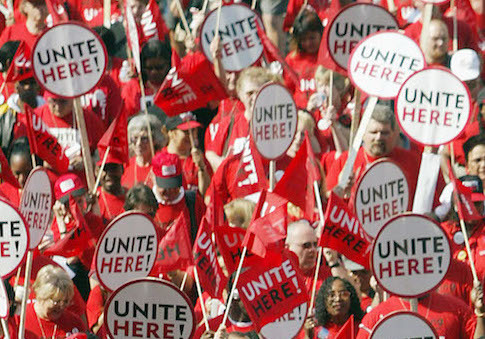 UNITE HERE Local 2 will hold a strike authorization vote on September 13. SEIU-UHW's contract with Kaiser Permanente is set to expire in the fall. This entry was posted in Issues and tagged California, Unions. Bookmark the permalink.